Yabun means ‘music to a beat’ in the Sydney Aboriginal language. 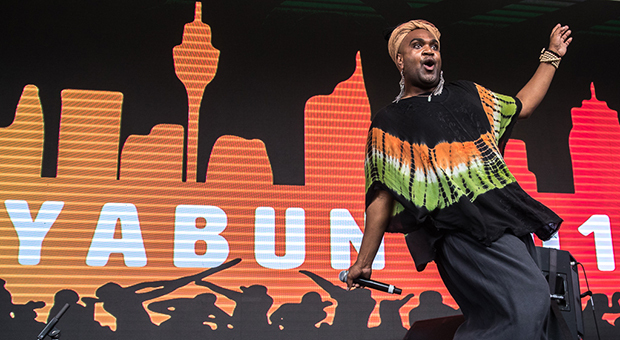 Now in its 18th year, the Yabun Festival is organised by Gadigal Information Service and has grown to become the biggest one-day celebration of Aboriginal and Torres Strait Islander cultures. The annual event takes place on 26 January to recognise the survival and resilience of Aboriginal and Torres Strait Islander cultures. This year will feature an extended corroboree ground showcasing performers from across the country, bustling market stalls featuring Indigenous businesses and the speak-out tent where community discuss a range of important topics. The main stage presents both established and emerging music to cater to all and celebrate the diversity of First Nations songwriters. This year includes the legendary Roger Knox, singer/songstress Thelma Plum, multi-award winning Kutcha Edwards, pop/soul singer and X Factor winner Isaiah Firebrace, local roots reggae outfit Green Hand Band and Redfern hip hop MC Sonboy.